Nicks Place Fremantle uses their own specialised couriers to deliver their food. 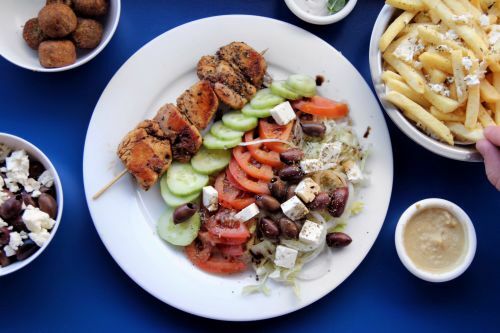 The Greek kebab all served with onion, tomato, lettuce and your choice of sauce. Feta, onion, tomato and lettuce, with salad (onion, tomato, lettuce and sauce). Egg, cheese, onion, tomato, lettuce and sauce. Capsicum and feta omelette with salad (onion, tomato, lettuce and sauce). Spinach and feta omelette with salad (onion, tomato, lettuce and sauce). A smaller kebab in a light wrap, BBQ'd lamb or chicken wrap. BBQ Lamb, Chicken or Pork with Chips and toppings of your choice. 1 Dip and 2 Pitas. Trio of BBQ' d meats, Greek salad, dip and pita.